Before the arrival of the Europeans in the early 16th century, Canada was inhabited by its First Nations. They did not use currency but traded in goods and services on a barter basis. Certain objects, however, were regarded as having special economic and social value. 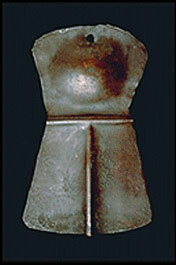 This copper shield is one example. It was used by the Haidas of the west coast as a measure of wealth and in gift-giving. For example, chiefs who wanted to demonstrate their wealth and respect for their friends might offer such a shield as a gift to the chief of a neighbouring tribe. That chief would eventually offer a gift of similar value in return.